This hot, cheesy spinach dip is the type of dip that guests hover around at a party. You don't want to eat more, and yet....you can't resist. You won't find any mayonnaise in this spinach dip. Instead, cream cheese, creme fraiche, and richly flavored Alpine-style cheeses are melted together with fresh baby spinach. Fresh jalapeno pepper is optional but adds a spicy kick that makes the dip truly addictive. 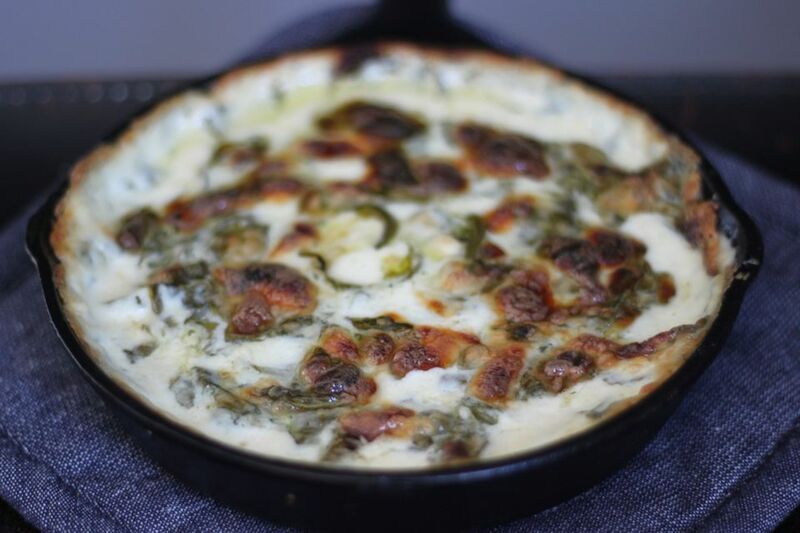 This recipe doesn't make a huge portion of spinach dip, but trust me - it's so rich that a little bit goes a long way. Looking for spinach dip that isn't quite so rich and creamy? Try this light and bright lemony spinach dip recipe. Add milk. When it’s gently simmering add cream cheese and stir to melt. Add crème fraiche and grated cheese. Mix well to melt cheese. Add spinach in three batches, stirring to wilt. When just barely wilted, add jalapeno. Transfer to prepared baking dish and bake on the top rack of the oven for 15 - 20 minutes until bubbly and golden brown. Serve hot with slices of baguette. Recipe Note: A whole jalapeno can potentially make the dip really spicy. Consider adding half the pepper, then tasting the dip after it cooks and adding more jalapeno if needed. Alpine cheese is a style of Swiss, French or Italian cheese made from the milk of cows who graze in high mountain pastures. Alpine cheeses typically have a semi-firm to hard texture with a dense paste that melts well. The flavor is rich and full, often with nutty, grassy, buttery qualities. There is nothing bland about Alpine-style cheese, which makes it a great melting cheese for really flavorful hot dips or fondue. Ask your local cheesemonger to recommend their favorite Alpine cheese, or choose one of these Alpine cheeses: Gruyere, Comte, Hoch Ybrig, Beaufort, Abondance, and Fontina Val D'Aosta.